In 1999 we were the first hog roast & bbq family business to specialise in providing spit roast catering across the UK. I work together with a British fabricator to produce the first CE approved hog roast machine in made in the UK. We now operate twenty spit roast machines and fifteen commercial barbeques catering and hiring a DIY solution. Since 1991 we have competed with illegal and dangerous gas spit roast machines operated by a host of dubious suppliers. We are now nominated by Plantation Pigs Ltd the famous free range pig farm operated by Hugh Norris. Our decision to use Plantation Pigs was based on our experience of buy commercial pork for a number of years. Since working with TV Celebrity Chef Brian Turner I have discovered that British Free Range Pork is the best pork available. I buy on average 1,000kgs of Free Range meat per week. During a period of high feed prices we had to use imported pork for our hog roasts supplies which were sourced from Europe. The quality of that meat was nowhere near the quality of the free range local pork we supply now. BBQ hire and catering supplying our own hand made burgers, kebabs and sausages also plays a large part of the bbq and hog roast catering family business. My sons run the spit roasting business, if you want a chef & assistant, carve and serve, or a DIY spit roast please go directly to their website The Hog Roast Company. Over 10 years of supplying spit roasting services in the UK is a difficult act for anyone to follow. Now that we have over 10 years behind us in hog and lamb roast catering we now reap the benefits and rewards from being the market leaders for so many years. 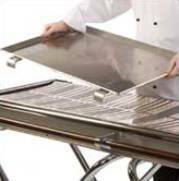 New hog roast caterers come and go frequently our service remains the industry standard. Our investment in the best fully automatic hog roast rotisseries means that repeat business is gratefully acknowledged. Free Range pork or lamb is available to buy with or without a spit roast machine. You might have a butcher that can supply your pig or lamb. The chances are it's a Plantation pig or South Downs lamb. Genuine Free Range will have markings all over the outside skin validating the quality of your purchase. Commercial pork is considerably cheaper than Free Range pork. We believe our prices are competitive in comparison to other suppliers. CE approved spit rotisseries plus free range pork, equals a successful spit roast. Spitting a pig or lamb is a reasonably skilled challenge, perhaps left the professional. Outdoor BBQ Hire - Easy. Planning an outside catering event is a daunting for even the most experienced professional cater. We can give you valuable information based on our own experiences which range from 30 guest events to 5,000. The secret of barbequing is the quality of the meat, understanding the timing for each bbq item and having the correct equipment. My first bbq volume bbq event was to barbecue 3,000 bbq items. I purchased several low pressure LPG stainless steel bbqs which didn't make the job very easy. Although we completed the event for 1,000 guests I realised that we had the wrong tool for the job. The only other bbq on the market was the Cinders 6ft Caterer. You can see on the left a bbq griddle which used in combination with the cinders 3ft or 6ft barbecue ensures that you can multi-task at your bbq whether you are cooking fish, burgers or sausages. 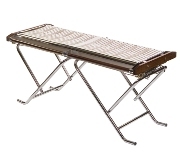 Heat from the bbq transfers to the griddle plate and cooks your meat of fish without any risk of fire. All burgers, chicken, and lamb have a percentage of fat which may catch fire on charcoal or directly on a gas bbq. We have a client that hires 10 x cinders 6ft bbqs and 20 griddle plates for a 3,000 guest event every year. Each griddle plate will cook 15 burgers to perfection every 8 minutes. Our local hire centres are fed by our central warehouse during the week and delivered out to clients thereafter. Collections are normally on available from our central warehouse. Local hire offices hold stock for regular or contract bookings. We provide a delivery service for customers in Surrey, Hampshire, Kent, London, Kingston, Wiltshire, East Sussex, West Sussex, Gloucestershire, Dorset, Berkshire, Guildford, Reading, Chippenham, Swindon, Swansea, Oxford, Bath, Brighton, Hove, Bristol, Chichester, Exeter, Cardiff, Gloucester, Kingston, London, Oxford, Portsmouth, Salisbury, Southampton, Westminster, and Winchester.